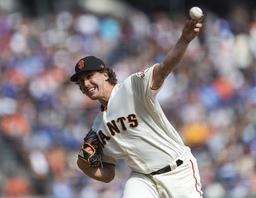 SAN FRANCISCO (AP) Left-hander Derek Holland is staying with the San Francisco Giants, agreeing to a one-year contract that guarantees $7 million. With all the injuries to the rotation last season, keeping the versatile Holland provides a big boost to the pitching staff. "For me, it was just an easy decision to come back after everything these guys helped me basically as I looked at it as resurrecting my career," Holland said. Holland has a $6.5 million salary this season as part of the deal announced Monday, and the Giants have a $7 million option for 2020 with a $500,000 buyout. The option price can escalate based on starts this year, by $500,000 each for 24 and 28, and by $1 million for 32. The 32-year-old was 7-9 with a 3.57 ERA in 30 starts and six relief appearances over 171 1/3 innings in his first season for San Francisco. "From our standpoint going back to the winter meetings, it's been a priority to add some starting pitchers, partly to take some of the pressure off the younger guys," president of baseball operations Farhan Zaidi said. "It was really encouraging to see that he made those 30 starts but also got better and stronger as the season went along. That's always an encouraging sign when you're looking at the free agent market of pitchers, guys who finished strong. Derek had a terrific second half." Holland dropped his ERA from 6.20 with the White Sox the previous year, the second best improvement by major league pitchers, according to STATS. San Francisco considers Holland a starter but appreciates his ability to come out of the bullpen as well. "The way I look at it, I'm always competing for a spot," Holland said. Holland, who spent the first eight of his 10 big league seasons with Texas, helped fill a void in the rotation when the Giants dealt with injuries Madison Bumgarner, Johnny Cueto and Jeff Samardzija. Manager Bruce Bochy appreciated Holland's leadership the whole way, especially when so many stars were hurt. "When we're getting an experienced guy like Derek who did just a terrific job for us and what a great teammate he was for us this year," Bochy said. "He had some intangibles that we really liked to go along with the body of work that he gave us. He really gives us just a sense of comfort." The Giants still plan to add to the depth of their starting pitching.